Super Breakout is a block busting game that was originally released in the Arcades in 1978. It requires either the analog joystick or the Trak-Ball controller, and the objective is to continually bounce a ball off your paddle to smash walls. Points are awarded based on the brick colour you hit, with the most valuable being towards the very top. You only have five balls per game and if one lands below your paddle a ball will be deducted. The joystick works well to mimic the precision movement of the Atari 2600 paddles allowing you to delicately move across the playfield or dash at lightning speed. There is some jitter though which isn't helpful when the ball is careening back at full speed. The Trak-Ball provides a good alternative (with zero jitter), but it's tough to stop on a dime due to having to take your hand off for a split-second (resulting in very slight travel). 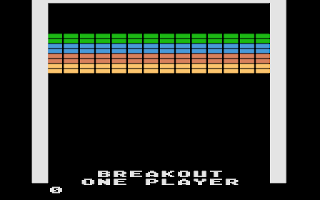 There's only four variations compared to the 2600's twelve, the first of which is Breakout where you face regenerating 14x8 walls; it's a simple, yet fun concept that advances the Pong (1972, Arcades) formula to create more intense gameplay. In Progressive, the walls constantly move downwards in 14x4 staggered patterns; it's the standout variation as the gaps in the walls give you ample chances to lodge the ball so it repeatedly bounces off bricks for huge points. Double includes two balls in play at the same time, along with an extra stacked paddle; the fast speed that each ball travels makes it unwieldy to keep both in play and you'll likely lose one of them very quickly. Cavity sees two balls trapped inside two sets of walls; it suffers from the same problems as Double and instead of being an interesting hook the trapped balls are a hindrance. There's nothing particularly 'super' about Super Breakout, and while it is a fun game in small doses, the lack of variations when compared to its Atari 2600 counterpart makes for a less appealing package. On top of this, the controller options (while admittedly decent) aren't quite as refined as the paddles for high score attempts. 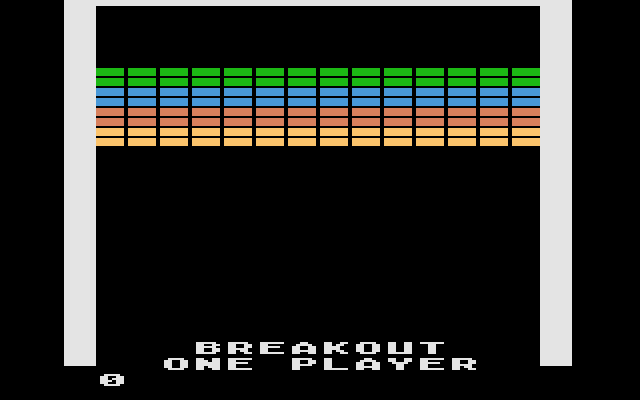 Random trivia: Super Breakout was the pack-in title for the Atari 5200 console.